An employment advertisement regarding IGIMS Recruitment has been delivered by Indira Gandhi Institute of Medical Sciences to inform the Achievement oriented and skilled Candidates for the 140 unoccupied posts of Store Keeper, Sister, Technician. Eligible Job seekers can apply for IGIMS vacancy by filling offline application form before the end date which is 20th April 2018. Education Needed: Job finders should have passed 10th with GNM / 12th in Science / Diploma / Graduation Degree / M.Sc. in Physics / M.A./ Ph.D. (psychology/Clinical Psychology) / Master’s Degree (Social Work/Psychology/Economics/Commerce/Statistics) / PG Diploma with good academic records from well recognized Institute / board. Applicants who belong to the category of SC/ST & who are willing to apply they have to submit application processing fee of Rs. 125/-. Contenders who are interested to apply for any of the above mentioned positions they should be in between 18 to 30 Years (Post 2,3), 18 to 25 Years (Post 8) As on 20-04-2018. Applying candidates should not be exceeding than 35 Years (Post 1,5,6), 30 Years (Post 4,7), 40 Years (Post 9) As on 20-04-2018. Pay Scale: Candidates who will be recruited successfully they will get attractive and satisfying salary of Rs. 15600 - 39100/- With 5400/- Grade Pay (Post 1,4,7), Rs. 9300 - 34800/- With 4600/4200/- Grade Pay (Post 2,3,5,6,8), Rs. 35,000/- (Post 9) from IGIMS. Contenders the first and necessary step is to visit the official site of the organization that is http://www.igims.org. Closing Date to Submit Hard Copy of Application Form Is : 20-04-2018. Click Here For IGIMS Job Notification Link. Indira Gandhi Institute of Medical Sciences is looking for the Capable and Motivated Contenders for the engagement of 03 positions of Field Officer, Administrative Assistant. 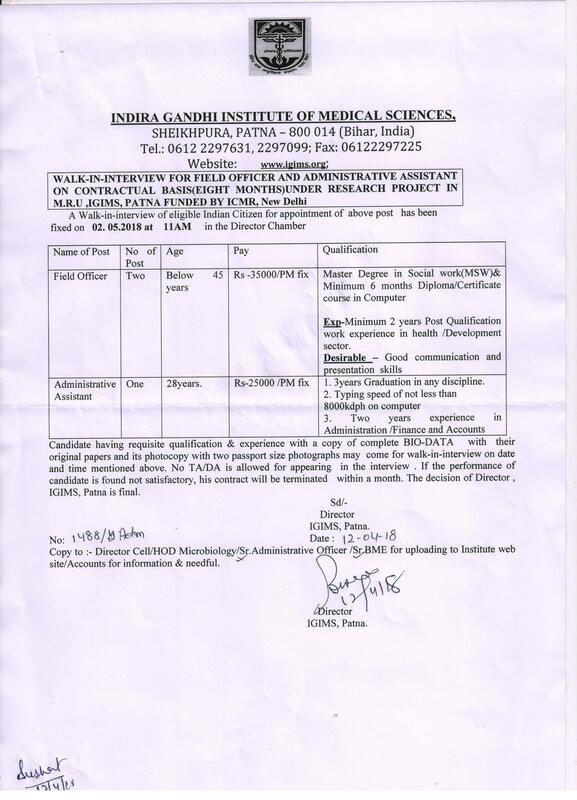 Recently, Indira Gandhi Institute of Medical Sciences has advertised A vacancy notification regarding IGIMS Recruitment. To complete this recruitment process Participants who desire to grasp Jobs in Govt Sector can attend walkin interview on 2nd May 2018 at the given venue. Qualification Required: Job seekers should have completed the education as Master Degree (Social work) / Graduation Degree with good academic records from well recognised University/ Institute as per the applied posts. Applying candidates Age must not above than 45 Years (Post 1), 28 Years (Post 2). Salary & Pay Band: Appointed aspirants for Field Officer, Administrative Assistant posts will get remunerations of Rs. 35000/- (Post 1), Rs. 25000/- (Post 2) which is offered by Indira Gandhi Institute of Medical Sciences. Assortment of job finders for above posts will be based on their appearance in Interview which will be conducted by Indira Gandhi Institute of Medical Sciences on stipulated date. Firstly, approach on web portal of IGIMS that is http://www.igims.org. Walk in Interview Held On : 02-05-2018.